Home > Blog and Latest News > Archive > You are the making of your own success. Just drive the vision. Young people deserve the best opportunities to excel at what they enjoy and what they are good at. At the end of the day, young people are the leaders of tomorrow. I’ve always had visions of one day starting and then running a charity, to strive for the improvement of something, to give someone something they may not have had without that ‘something’ being in place. Perhaps a platform to help young people grow, develop and at the same time educate, empower and enable advocates to bloom. I had done my fair share of research into other organisations which already had set up a similar ethos, but one thing which was constantly sticking out was the lack of actual young people behind the running’s of the ‘young people’s’ organisation. Mind blowing to find that almost all executives, charity trustees, and other managerial roles where taken up by adults in their late 40s and 50s. How could that be right? Of course, adults have far more experience in the fields, qualifications and whatever else which granted their position, but surly a young people’s charity or NGO or any organisation focusing on youth should strive to have a majority or 50/50 percentage of young people alongside adults on the board. In 2013, I began my work with a few charities. 6 of my friends and myself were training to swim the English Channel in the summer of that year. We completed the swim, and broke the records since 1998. We were all so pleased and the feeling of accomplishment, success and foresight which had entered my head was an incredible feeling. That moment when we had touched down on the French side of the channel, was when it all hit me. The moment I decided to take my ambitions or ‘dreams’ as a lot of adults would say, and put it into real life. It had taken almost three years, three years of struggles, depression, ups and downs, the good, the bad and the ugly. Straight after the swim, in August 2013, I started writing down notes on what I had in mind. It started with perhaps going down the route of extreme sport, and getting young people involved in sport and allowing their sporting ambitions to grow to allow empowerment to develop. I had named it ESCA, or Extreme Sport Challenges Association (what a mouthful). To be honest, I was just playing around with ideas, and still had the buzzing feeling from our own extreme sporting event. But it was never really what I envisioned. After some time, procrastinating on the thought of changing everything, I decided the best thing was to start again. Come up with something better, further universal which would empower more young people, allow greater youth to grow, which was when I started the World Youth Organization, along with two other friends. It was now late 2015, and am now 17 years old. We had just finished filming our advert for the charity, which involved 30 young people, and an Olympic diver, the amazing Hannah Starling. We shot at four different locations, including a secondary school based in Essex, a swimming pool to shoot the diving scene, an animal sanctuary and office building based in London. We had a crew of 6 people, including the brilliant Finn Sims. Despite it being an amazing experience, personally it was stressful, as I had to organise things left, right and centre, including the arrangement of public liability insurance to film at the swimming pool, coordinate costumes, timings, cast, costings etc. The list goes on. But it was my first moment of seeing the charity come alive. We had young people all over the place, doing jobs which adults would usually do, so can I just say, it’s possible, youth can be grownups once in a while, and no one should doubt us. The advert is set to be released on MTV and Channel 4 in Summer 2016. It was the first ‘WOW’ moment I said to myself, and since filming, there have been many more ‘WOW’s’. Our legal status was currently a company registered with Companies House. I, along with two other friends were company directors. Which was definitely not what I wanted, we were always going to be a charity, not-for-profit, NGO etc. I so desperately wanted charity status for our organisation, as I knew this would open many more doors for the World Youth Organization. So, in true fashion I began looking into this! Throughout 2015 I had started looking for trustees to join the soon to be official registered charity. As I was still under 18 (and still am) I legally I wasn’t able to become a trustee. Today we have six trustees, in fields such as law, organisational development, marketing, policy writing, and fundraising. Along with our trustee board, we have a safeguarding officer, international relation directors, press officers and social media managers. I even have my own EA or executive assistant, which is pretty cool. On the 5th January, the World Youth Organization gained legal charity status in England and Wales. It had taken almost 12 months to get the status from the Charity Commission, many late nights of rewriting our governing document and other policies which went along with the registration process. Despite losing a little hair, it was all good, and I couldn’t have been any happier. Getting there, as you can tell was hard. I had numerous meetings with my college counsellor as I had developed a somewhat mild form of depression, the doctor had put me on anti-depressants, which all resulted in me leaving school, to continue my charity full time. So here we are. A charity. A ‘dream’ many adults doubted I could ever achieve. We launched the organisation officially on the 11th January at the most prestigious building in London, the Houses of Parliament. Since then, we’ve been verified on Twitter, which is pretty epic, developed a vibrant, informative website, and secured our few first sponsors. I’ve always had visons of one day starting and then running a charity, to strive for the improvement of something, to give someone something they may not have had without that ‘something’ being in place. Perhaps a platform to help young people grow, develop and at the same time educate, empower and enable advocates to bloom. 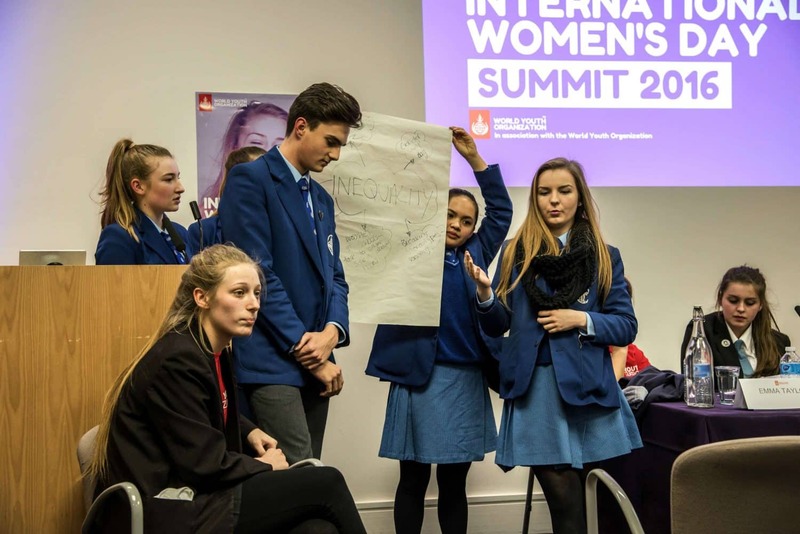 The World Youth Organization (WYO) now runs workshops, summits and other forms of events to educate, empower and to create advocates, for the young people across the world. You are the making of your own success. You can do anything, just drive the vision forward, and you’ll get there. Robots for medical use – a cure to illnesses or a disease to kill?